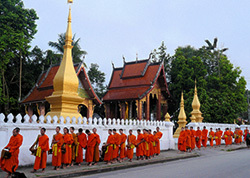 Laos join in tour with monthly departure from Luang Prabang! 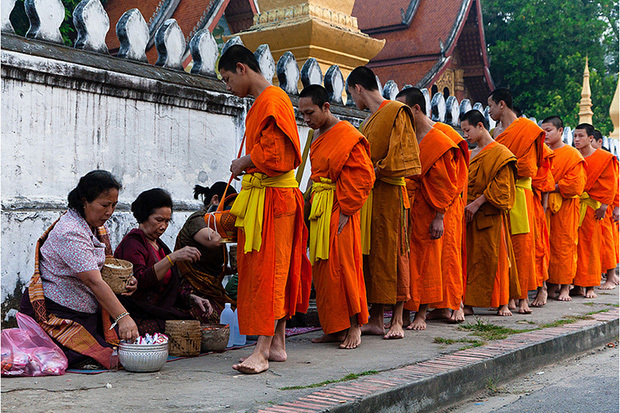 Described as "Thailand 40 years ago", Laos continues to offer travelers an adventure off the beaten track. Here, wander the peaceful temples of a devoutly Buddhist nation and step back in time to colonial days of palms, villas and royalty in World Heritage Listed Luang Prabang. Enjoy the landscapes on the way to Vientiane, the mountains and their minorities... An extension will lead you into the far south of Laos! 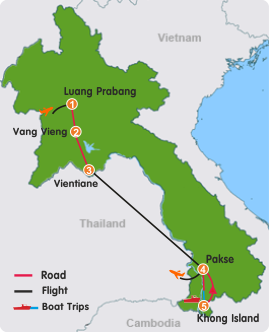 Upon arrival/pick up at airport – Here we start our delightful visit in Laos. 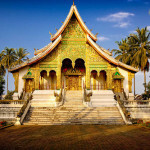 After checking into hotel, Join us on a city tour visiting Wat Visun, Wat Aham, the beautiful Wat Xieng Thong, walking along the street to Wat Mai. 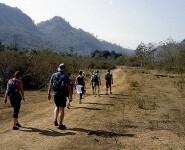 This afternoon climb Phu Si-hill to enjoy the view overlooking the city and watch the amazing sunset. From here we can see the magic Mekong and the small Nam Khan rivers. From there, we explore Street Night Bazaar, where you can find the lovely collection and handmade textile by local and hill tribe people surrounding Luang Prabang. Today after breakfast get a transfer to the pier then enjoy a trip by private long boat on the Mekong river to Pak Ou, stop en-route to visit Muang Kham (Lao Lum), if you wish, Ban Xang Hai (Lao Lum), where the distillation of rice whisky (Lou Lao) can be seen. 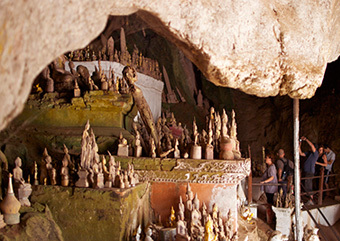 Then continue onto Pak Ou, visiting the exciting "Tham Ting cave", before crossing the Mekong to Ban Pak Ou. On our way back we will visit the village of Ban Xang Khong. 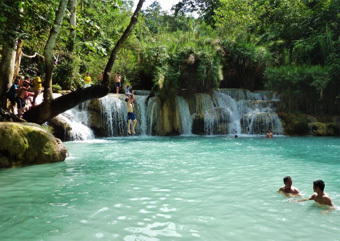 To experience some of the outstanding nature around Luang Prabang you may choose one of the following tours. 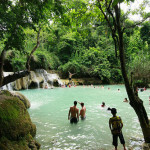 The tours include soft activities and bring you out to meet local people and nature. 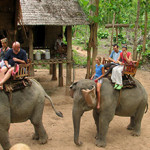 Half day tour: Weaving village, Elephant Park Project visit & Elephant ride, Nam Khan River, Tad Sae waterfall, life on the countryside. The rest of your day is free at leisure. 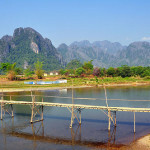 After breakfast at your hotel, we will leave Luang Prabang for Vang Vieng by car. Amazing mountain sceneries, beautiful landscapes and village visits along the way. Afternoon walk in the great carst mountain scenery and visit of surrounding caves. Overnight in Vang Vieng near the river. After breakfast will drive by minivan to Vientiane, the capital of Laos. 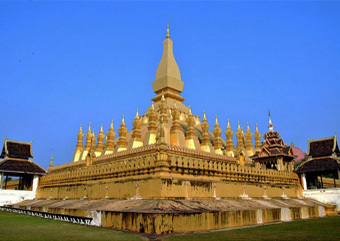 After checking in your hotel we'll start visiting the major sights of interest of Vientiane. 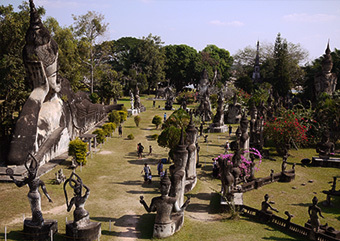 Wat Sisaket, a temple of thousands of miniature Buddha statues and the former royal temple of Wat Prakeo previously housed the famous Emerald Buddha Image. On the way to the famous, sacred structure of That Luang Stupa, we stop to take some pictures of the imposing Phatuxay Monument, which is Vientiane’s own Arc de Triumph. Breakfast, we take an early flight to Pakse. Upon arrival we will drive to Bolaven Plateau where there are the coffee and tea plantations, on the way we also visit the villages of Lao Theung. Departure from Tadlo and drive back then from Pakse and travel on a wonderful local ferry over the Mekong River to Champassak. Here we visit the sacred Khmer temple of Wat Phu. 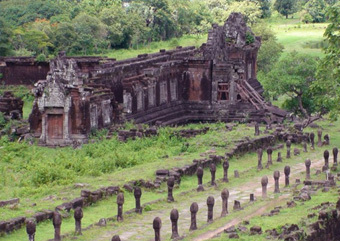 This complex represents the most eastern border of the Khmer Empire in the 4th century. Later in the afternoon we take a scenic drive and ferry boat to Don Khong. This island is one of the larger permanently inhabited islands in the ‘si pan don’ area. Dong Khong is best explored by bicycle. A reasonable dirt road circumvents the island. By boat we’ll explore the 4000 islands area (si pan don). Here, the Mekong river is at its widest. During the rainy season it is up to 12 km across. When the waters recede, many small islands emerge. It is from this phenomenon that the region takes its name. From far distance you can hear the unmistakable roar of the Khone Phapheng and Li Phi falls, which we will visit today. Nearby the falls live some hundred Irrawaddy freshwater dolphins. Ban Hang Khon is one of the rare places on earth to spot these endangered mammals. 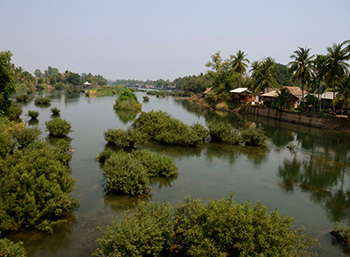 Also see the old locomotive, railway and colonial bridge built by the French to avoid navigating on the rapids and waterfalls that abound on this section of the Mekong. Breakfast; transfer to Pakse Airport for departure flight. Private transport by van, all transfer in/out, slow boat trip&ferry boat, accommodation in sharing twin room with daily breakfast + 1 Dinner, admission fees to tour sites, elephant riding fee, local English speaking guide,1 bottle water/pax/day, Government tax, service charge. Travel insurance, entry visa fee, drinks during meal, personal expenses, banking transfer fee/Bank commission charge, all Inter national& domestic airfares and other not mention up above are in the charge of clients.